A partnership of 12 colleges and universities in West Yorkshire that offers enhanced support and various programmes to care leavers on their ‘student journey’ from school to higher education and into work. Go Higher West Yorkshire (GHWY) is a regional partnership of higher education (HE) providers which comprises six colleges (all with HE provision) – Bradford, Calderdale, Kirklees, Leeds College of Building, Leeds City, and Wakefield – and six universities – Bradford, Huddersfield, Leeds, Leeds Arts, Leeds Beckett and Leeds Trinity. The Partnership recognises its responsibility to support care leavers in their transition to adulthood. The decision to sign up to the Care Leaver Covenant was a logical response to the Government’s 2016 strategy which built on existing collaboration on widening participation, and individual partners acknowledged that working together on an approach for care leavers would achieve bigger and better outcomes. A period of consultation enabled the partnership to identify all the existing ways in which care leavers were already being supported, and further ways in which individual partner institutions could support this group of learners. It has been used by partners to benchmark and improve their offer. The Learning and Work Institute was engaged to ensure that the Covenant would be both a meaningful declaration and a valid resource. The GHWY Care Leaver Covenant was launched during the October 2017 National Care Leavers Week. The Covenant is offered as an online bank of information, or a concise document which begins with a ‘declaration’ of intent and includes a table showing the support offered to care leavers in each of the 12 partnership organisations. The essence of support for care leavers follows the stages in the widening access ‘student journey’, from initial work on raising aspirations through Foster Family Fun Days, through help with applying to college or university, and through various forms of help while they are students. GHWY’s Collaborative Care Leaver Covenant has, as its primary focus, the outcome of ‘improved access to education, employment and training’. The table of support (see below) shows three activities across all partners: Foster Family Fun Days, which are collaborative events aimed at younger children in care; pastoral support for those in higher education; and a named contact for information. It recognises the importance of additional pastoral support for care leavers throughout the ‘student lifecycle’ and ‘named contacts’ facilitate a coordinated approach to pastoral support in each institution. Other support activities vary across the partners. Those offering residential summer schools give priority places to care-experienced young people. Some offer additional and early support and advice from institutional contacts during the application process including: advocacy, contextual admissions and subject-specific schemes. The Covenant also focuses on the outcome of ‘support for independent living’ by prioritising care leavers in applying for, and staying in, accommodation. Where accommodation is offered by partners, this means all-year-round. Other forms of help include: emergency housing, help with guarantors, deposits and references. Also included in the Covenant offer, are forms of financial support which help with the outcome of achieving ‘financial stability’, i.e. care-leaver bursaries, scholarships and priority access to welfare/hardship funds. ‘Buddy’ and mentoring schemes in some institutions support the outcome of bringing ‘greater stability’ to ‘care leaver’ students. The outcome of ‘improved access to employment and training’ is addressed through support from designated advisers, targeted skills support, employability events, work placements and priority access to student-ambassador roles. To share and promote the ethos and details of the Covenant, GHWY has met with foster-carer groups and local, looked-after young people, and attended celebration events (e.g. care-leaver events run by local authorities). GHWY has also used it as the basis of social-media campaigns for NCLW 2017 and National Care Day. 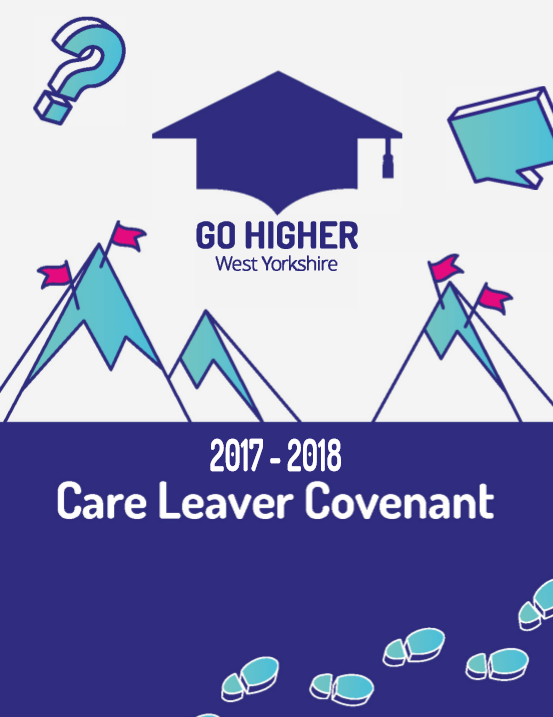 It emphasises the strength of the Collaborative Covenant within a localised framework, showcasing a display of regional excellence that, ultimately, highlights HE in West Yorkshire as ‘care-leaver friendly’. The Covenant has been a very useful resource for facilitating open and engaging conversations within communities. The set of offers that make up the Covenant reference, and seek to address, the challenges that looked-after young people may face in HE by highlighting the support available. GHWY works closely with local authorities, including Virtual Schools, to approach this sensitively and appropriately and to more broadly determine a co-aligned strategy for the progression of local care leavers. The Care Leaver Covenant was developed in collaboration with the GHWY Widening Participation Planning Group (WPPG: an operational group comprising a senior representative in widening participation/outreach/recruitment from each partner) and approved by the GHWY Board (the governing body, which comprises a senior strategic representative from each institution). The Covenant is subject to annual review and refresh, which involves working with the WPPG on the quality-assurance process, and includes reflection for continuous improvement in practice. The benefits of the collaborative element include idea-creation, improvement in standards, and sharing good practice. Currently GHWY is able to track users’ access of the Covenant online, which reveals a higher level of access during periods of high publicity. GHWY is in the process of designing a robust evaluation strategy for the Covenant itself as a resource which will effectively measure its use and impact, particularly in professional-and-community settings. Working alongside HE partners to determine the take-up and impact of the offers available is a further consideration for the partnership. The HE environment in which our partners are operating is subject to change, which can in turn mean there is an impact on the ‘offer’ an individual institution can make to care leavers. The annual refresh ensures that the information stays up to date, and that institutions regularly review any further opportunities they could provide. As a third-party resource, the success of the GHWY Covenant relies on the remote engagement of young people and their key influencers. It is, therefore, a challenge to ensure that the offers available, and the conversational potential of the Covenant, reach the intended audience across the region. GHWY utilises outreach opportunities and its relationships with external partners to spread the word as much as possible. Competition could naturally arise between the 12 HE providers in the region, however, partners are genuinely collaborative in their approach. There is recognition amongst partners that those entering HE need to make the right choice for them, and that care leavers may be drawn to different institutions for their own reasons. Equally, the opportunity to benchmark their offer against other local HE providers can prove helpful to those wanting to improve. Evaluating the impact of the Covenant through the provision of evidence is a challenge that GHWY is striving towards delivering. Particular challenges are around tracking users and data sharing. DO speak to young people you want to offer support or opportunities to and the people who know them well: they will tell you if your idea is good or not. DO consider any opportunity to collaborate with like-minded organisations and individuals, as this is likely to make your offer stronger and provide greater reach. DON’T lose sight of the individuals. ‘Care leavers’ is a catch-all term for a hugely diverse group of young people who have experienced all kinds of challenge and adversity in their short lives so far. DON’T try to do too much too quickly. Start small in order to manage the risk of trialling new things without any significant negative impact on young people. GHWY’s Collaborative Covenant is in its relatively early stages and is working towards reaching its full potential. There is appetite and support for the approach from communities, professionals, and the HE community. However, refinements will be needed to deliver a sustained commitment which continues to meet the needs of all stakeholders. The first annual review of our Collaborative Covenant will assess its format, content and usefulness and look to develop a robust approach to evidencing its impact.